In April 1961, Playa Giron was one of two landing sites for seaborne forces of about 1,500 armed Cuban exiles in the Bay of Pigs Invasion, a United States of America CIA backed, attempt to unseat and overthrow the new government of Cuban Prime Minister Fidel Castro. 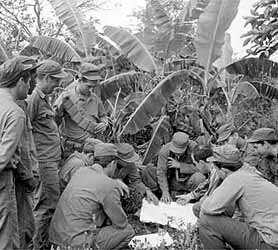 Over 70 hours of intense fighting took place in many parts of the Cienaga de Zapata swamp region with Playa Giron being the last remaining area occupied by the invaders. Today, the Museo Girón is a small museum dedicated to the historical conflict. The failed CIA attempt has been a long standing motive for angst between the two nations.